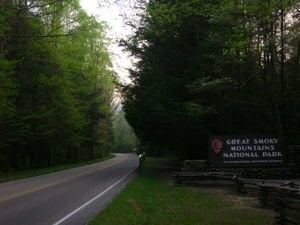 The Comprehensive Guide to the Smoky Mountain National Park and surrounding areas. Great Smoky Mountains National Park is a United States National Parkthat straddles the ridge line of the Great Smoky Mountains,part of the Blue Ridge Mountains which are a division of the larger Appalachian Mountain chain. The border between Tennessee and North Carolina runs northeast to southwest through the centerline of the park. It is the most visited national park in theUnited States.On its route from Maine to Georgia, the Appalachian Trail also passes through the center of the park. The park was chartered by the United States Congress in 1934 and officially dedicated by PresidentFranklin Delano Roosevelt in 1940. It encompasses 814 square miles (2,108 km²), making it one of the largest protected areas in the eastern United States. The main park entrances are located along U.S. Highway 441 (Newfound Gap Road) at the towns of Gatlinburg, Tennessee and Cherokee, North Carolina. The Great Smoky Mountains National Park is a major tourist attraction in the region; over 9 million tourists and 11 million non-recreational visitors traveled to the park were recorded in 2003, double that of any other national park. Surrounding towns, notably Gatlinburg, Pigeon Forge, Sevierville, and Townsend, Tennessee, and Cherokee, Sylva, Maggie Valley, and Bryson City, North Carolina receive a significant portion of their income from tourism associated with the park. The two main visitors' centers inside the park are Sugarlands Visitors' Center near the Gatlinburg entrance to the park and Oconaluftee Visitors' Center near Cherokee, North Carolina at the eastern entrance to the park. These ranger stations provide exhibits on wildlife, geology, and the history of the park. They also sell books, maps, and souvenirs. Provided by the web design company directory.